Handcuffed Hatem Ali at Mangaldai Civil Hospital on April 3, 2018. The injured handcuffed criminal, suspected to be a poacher, who escaped from the police custody recently while undergoing treatment in Mangaldai Civil Hospital after his arrest on April 3, has been rearrested within five days by police on Sunday. 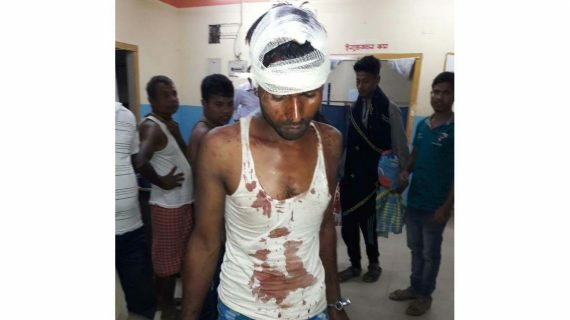 As per information, suspected poacher, 28-year-old Hatem Ali, who managed to escape from the Mangaldai Civil Hospital along with handcuff in the wee hours of April 3 last, was rearrested by Darrang Police on April 8 last from his hideout in Roumari Char under Shyampur Police Station of the district. The court has sent him to the judicial custody. It may be recalled that acting on an information about a possible financial deal for a rhino horn, the Darrang Police on the night of April 2 had laid a trap engaging police personnel in civil dress in the guise of buyers and make a deal with the poachers at Silbori village adjacent to Orang National Park and Tiger Reserve under Dalgaon Police Station. However, the gang of poachers taking the police men as traders and with an intention to loot their money attacked the police team causing injuries to three policemen. The additional police team led by Mohan Meena (IPS officer on probation) and Deputy Superintendent of Police Amit Kr Hojai immediately retaliated and nabbed one of the gang members, identified as Hatem Ali who also received injuries. The injured policemen and the accused were first brought to Kharupetia Primary Health Centre and then to Mangaldai Civil Hospital in the midnight. Handcuffed Hatem Ali was admitted to the male surgical ward of the Mangaldai Civil Hospital under strict police vigil and he was tied to the hospital bed. But in the wee hours, keeping the policemen on duty in the darkness, Hatem Ali got out of the handcuff and managed to escape from the hospital. After that, a Darrang Police team was on the hunt for the accused and on April 8, the team was able to nab the suspected poacher.